Which blocks do you chose? Poll added! We have two more blocks left in the Round the Year Quilt and you get to choose which ones they should be! So let me know which two blocks you would like. To vote, you can either leave a comment here, or vote on the facebook page “Patchwork of My Life”. You do remember that Block 15 will be released only around 15th April, don’t you? Happy choosing! I decided to add a poll to this post, to make it easier for you to vote! Author MadsPosted on March 24, 2015 April 13, 2018 Categories Patchwork of my life, Round the Year quiltTags Dreamcatcher QuiltLeave a comment on Which blocks do you chose? Poll added! I decided to add a poll to this post, to make it easier for you to vote! Please select two options. Author MadsPosted on March 24, 2015 March 24, 2015 Categories Patchwork of my life, Round the Year quilt11 Comments on Which blocks do you chose? Poll added! I started designing Block Fourteen as a tribute to the Dear Jane quilt. I experimented with a number of the Dear Jane triangular blocks, placing them revolving around a centre point to make a circle. 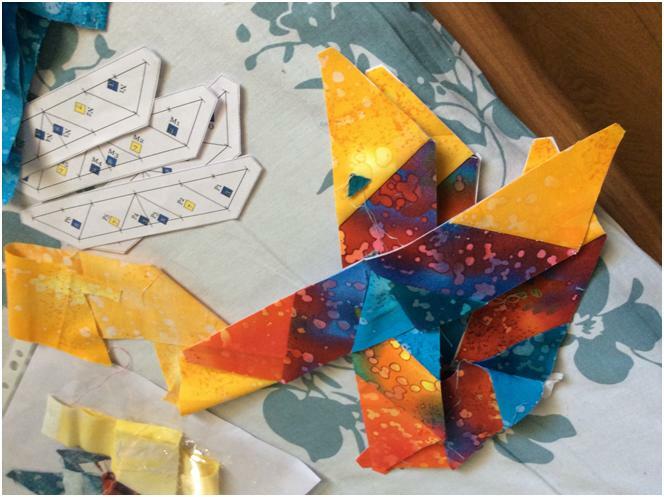 This design came about when I was playing (on the free Quilt Assistant software ) with the block where flying geese fly outwards. I immediately fell in love with it! 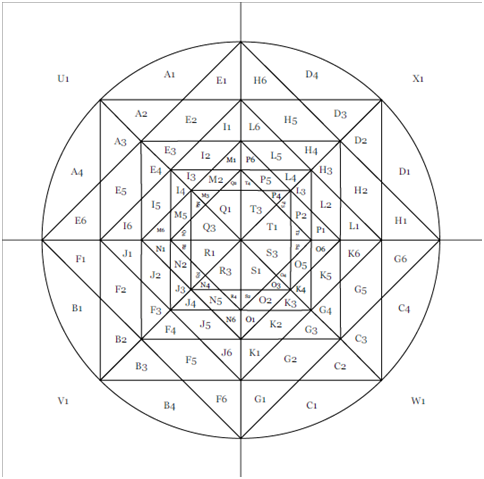 It does have a hypnotic quality to it, like a Mandala you can meditate upon. Also, if you take each of those wedges and subtract the outer level, the design remains the same. So, I have been trying ( in vain) to convince the few mathematicians whom I know, that this pattern a fractal! As a concession to them, I call this the (Almost) Fractal Mandala. 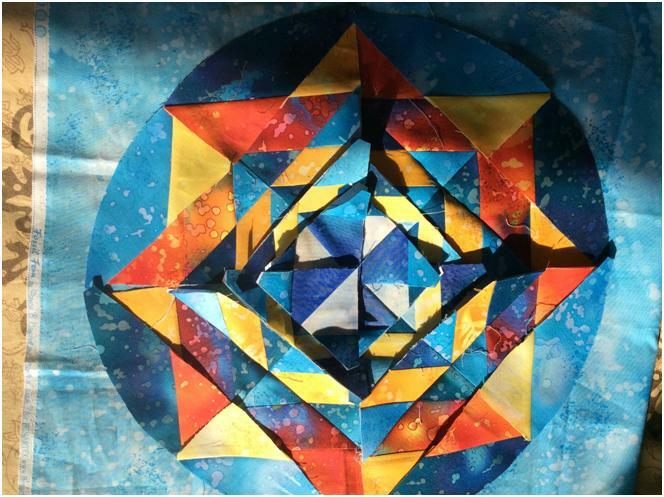 And so, I present to you, Block 14 of the Round the Year Block of the Month Quilt, the (Almost) Fractal Mandala! Much to my chagrin, I discovered after I had made the block, that a similar block ( I do not know the name) already exists! I am still very proud of it, because I discovered my Mount Everest on my own, and climbed it too! So there! 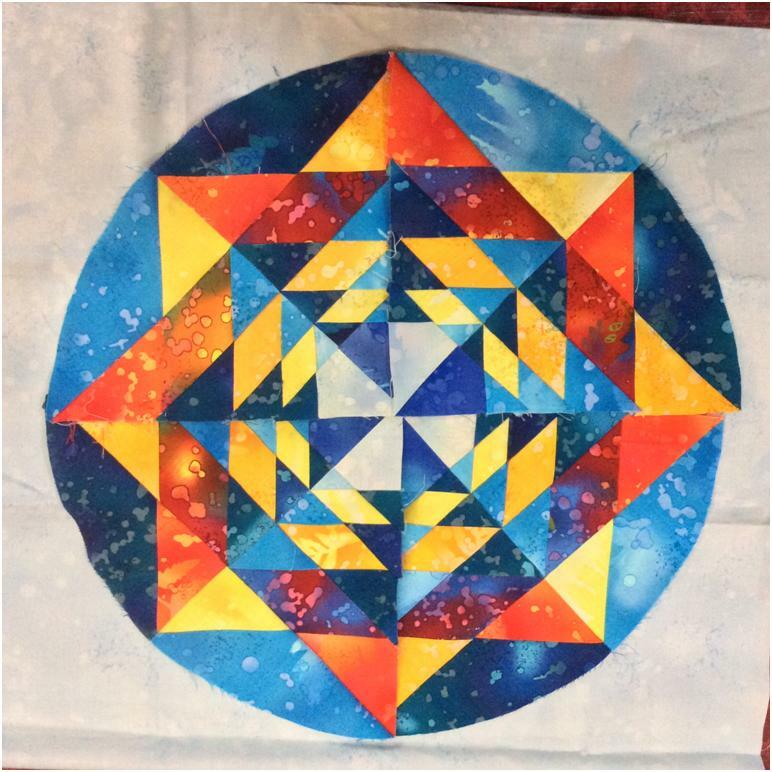 The block, like all other blocks of the BOM quilt, is designed as a 15″ circle inset in an 18.5″ ( unfinished) square. It is a deceptively easy block to piece, hence not too many photos accompany this post. The templates and instructions can be downloaded from the links at the end of this post. You can find the links to patterns for all the other blocks of this quilt on the Round the Year Quilt Page ( click on the link above). 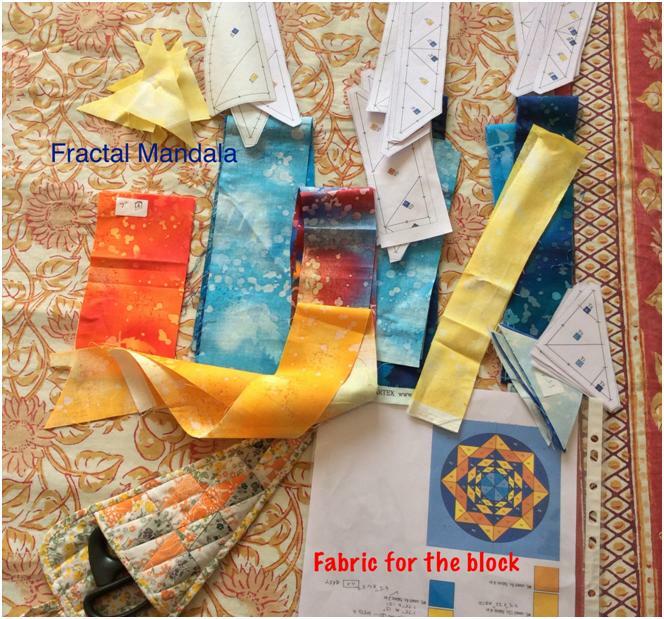 The brilliant Tina Katwal, one of the pioneer quilters from India, took out time from her busy schedule to test this block and you have to thank her, that you do not struggle with stingy fabric requirements! The Dusk colourway uses 4 shades of blue and 4 fabrics in a contrasting yellow to orange range. I suggest you use use solids or very small prints combined with solids to best highlight the design element of the block. I have used Fossil Fern by Benartex for mine. 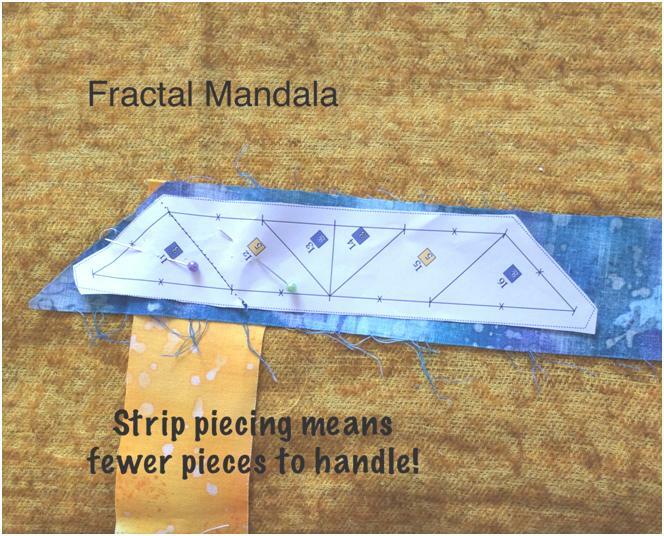 This is a great block for using any scraps/ strips of various sizes and shapes left over from the previous blocks. Nevertheless, I have tried to give some kind of estimate of the fabric requirement. Please spray starch and press all your fabric before cutting! 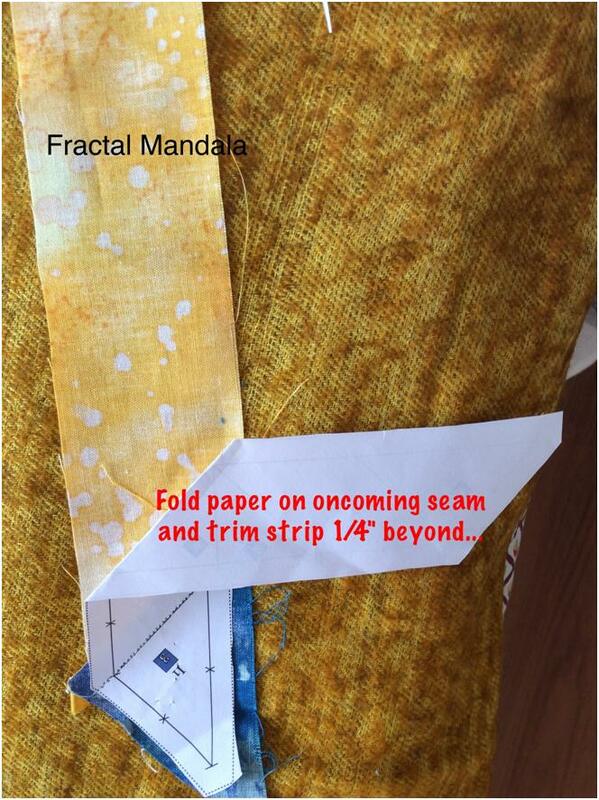 I suggest you label your fabric so that you do not get confused as you cut so many strips. 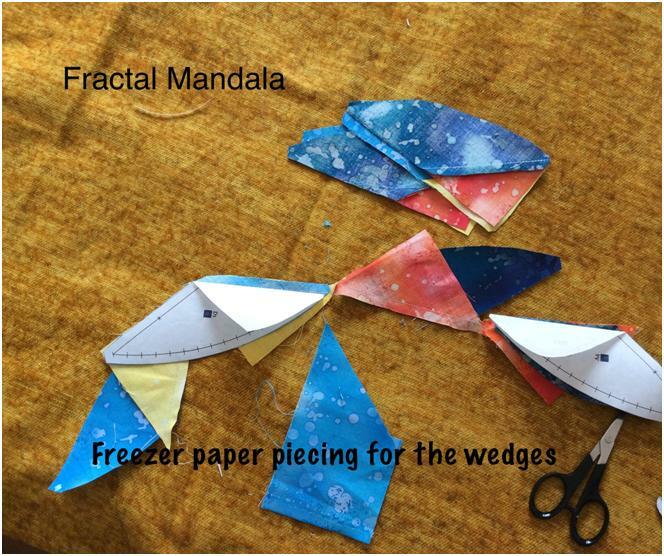 An easy way to do this is sticking a piece of freezer paper with the code on it on the strip! While I pieced with strips, I thought it would have made life much simpler had I cut the diamonds earlier. 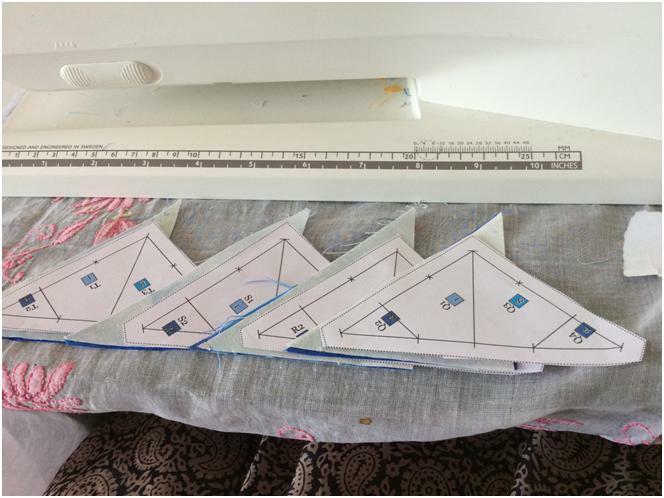 Note that the two sets of diamonds on each template face opposite directions, hence the 2 strips in the cutting instructions for the diamonds. Here is my fabric for the block, all cut and sorted. 1. Print the templates with your printer settings at 100% (or actual size). 2. Templates A to H are given in two parts each, with instructions to glue them. You could also piece these separately and then join at the centre seams. I have done that for the first two sets of templates, ABCD and EFGH. 3. Glue together the two parts of background Template U on the edge indicated. Use this to cut 4 identical pieces for U, V, W and X and put aside. 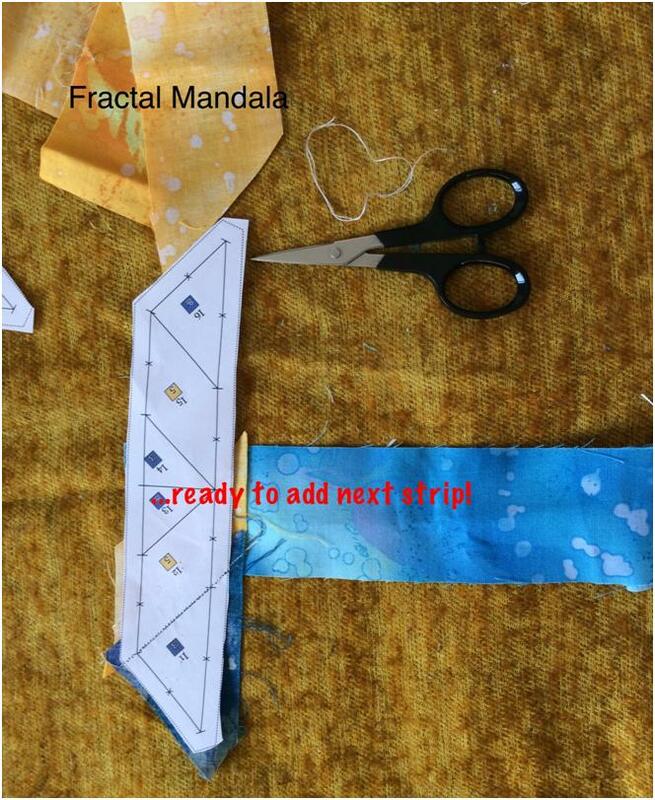 You can glue the two halves of the templates togeteher and piece them in one go! E, F, G and H were (each) also pieced in halves without gluing in the centre, and sewn together on the centre later, just before assembly. E, F, G and H pieced in halves…you can glue the templates at centre between piece# 3 and #4 and piece these as single units! For the rest of the templates, I pieced with strips, like I said, placing the strips perpendicular to each other as I went along. 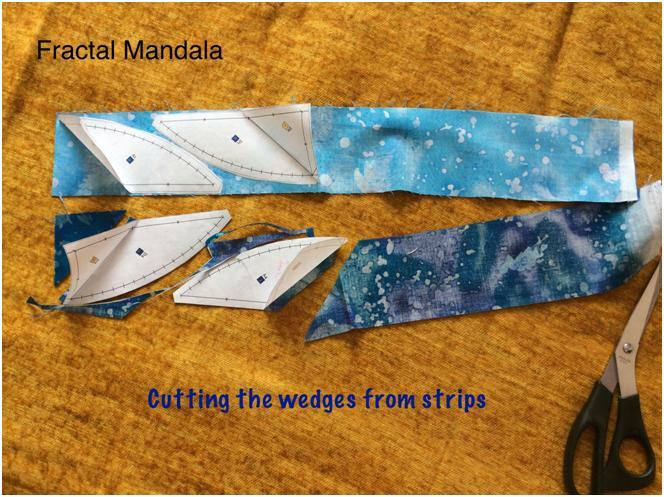 A triangular piece comes in next, note, in the upcoming photo, that the blue strip was placed straight along the template for this seam between piece #3 and #4. This is followed by another diamond strip at right angles to the template. 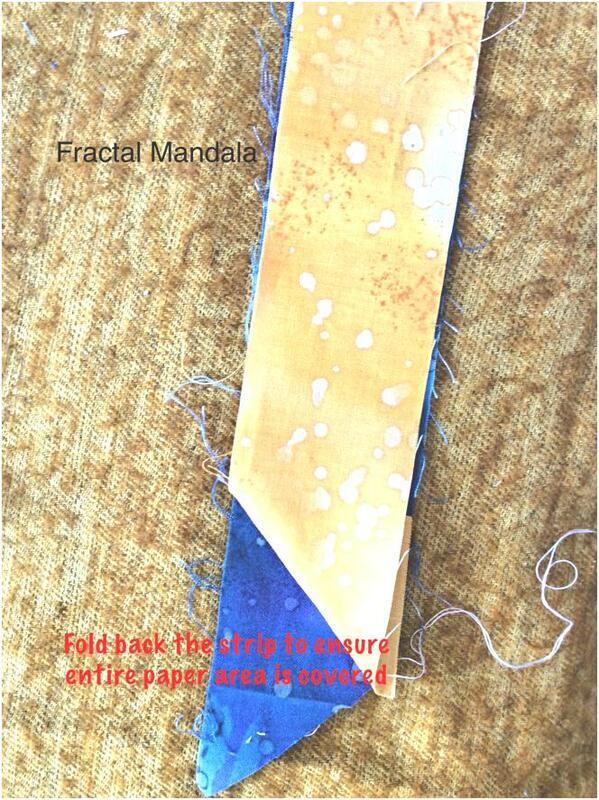 Use the other diamond strip for this! After that diamond, there is only one more blue triangle to add and we are done! Similarly, piece all the templates, I to P. Once you get the hang of it, it comes up really fast! 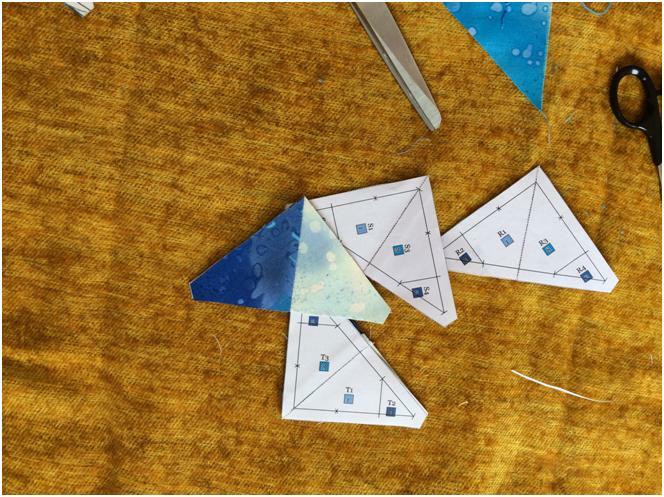 I did not take too many pics, but here are a couple of photos of the centre templates Q, R, S and T being pieced! …and done, except for the corners! Fast work! The scraps from the previous templates come in useful for the corners of the centre templates! Use the Master Template (mirror image) as a guide to assembly. The Instructions file also contains a coloured mirror image guide. I removed the paper before assembly. The Master Template is a mirror image! Left is right and right is left! Assemble the block in quadrants. But before you begin, lay them all together to see if all is in order, and of course, to admire! I love this! Piecing finished in one evening! Here is the finished circle, from the back. Note that seams on adjoining quadrants are pressed in opposite directions, so that they interlock. 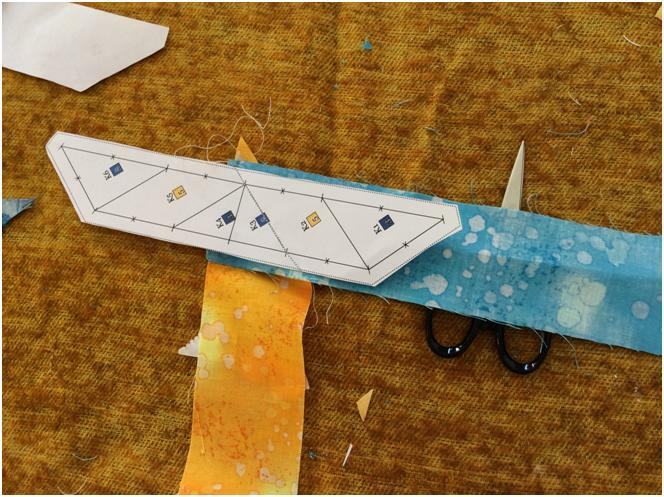 As far as possible, press adjoining seams in opposite directions to interlock them when sewing … ensures sharper corners! 5. Done ! Now join the background. 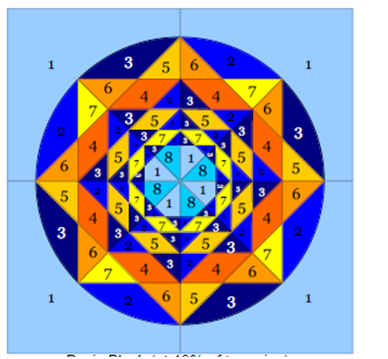 You can join the individual quadrants to the background pieces U, V, W and X and then join the 4 squares together to form the 18.5″ square. I am not joining any of the circles to the background till all of them are done. We begin putting the quilt top together in May, after the final sixteenth block comes up on 1st May. Block 15 will be posted only on 16th April 2015 as I am travelling and am otherwise busy, so you have plenty of time to catch up, if you began late or are straggling behind on the blocks. 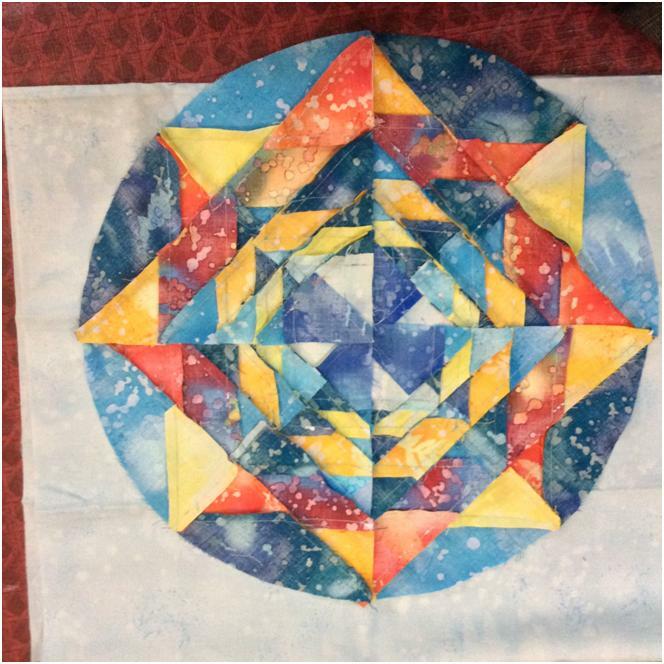 Meanwhile, do put in a comment if you like this block and are doing this quilt… and make my day! Please write in if you have a problem with the instructions, or if you discover a better way of piecing my blocks. I would also love to see your blocks posted on my Facebook page Patchwork of My Life. Okay, so we are all done here, except for one important thing, the block pattern and instructions! You need Adobe Acrobat on your computer ( available for free download) to be able to view these files.